One of the first science-based talks I gave was about how VCR tapes worked. Depending on how you viewed it (and whether you had to listen), this was either an achievement given that I was at school and didn’t really understand magnetism nor magnetoresistive devices, or a thing to be suffered through (for much the same reasons). 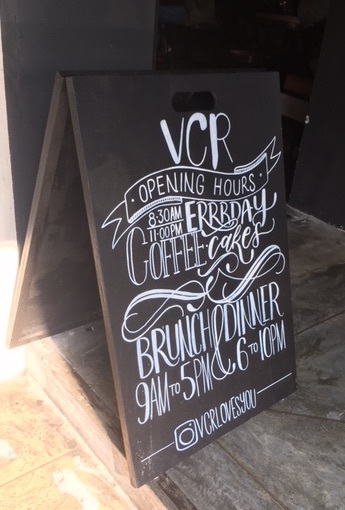 So when I learned that a new café called VCR had opened in Bangsar in Kuala Lumpur, it prompted a series of fond (and a few embarrassing) memories. Moving on, it is clear that this second branch of VCR (the first is in Pudu, in the main part of KL), aims to provoke such memories of times past. From the name of the wifi to the pulleys behind the counter and the wooden screen at the back of the café, various details around the café pull your memory in different directions. However the coffee is very much in the present. With three types of coffee available to try as a pour over as well as the standard espresso based drinks, this café has a lot to offer. The coffee is roasted by VCR themselves in their Pudu branch. There is also an extensive food menu with an interesting Chawan mushi as well as an intricate avocado toast (topped with pomegranate seeds, toasted quinoa and feta). Coffee and pour over jug. But is the number 68 or 89? The friendly baristas were happy to advise on which coffee to match with which brewing device (though there seemed a marked preference for V60s on the days I visited). In total I tried 4 pour-overs, one with the Kalita Wave and the others by V60. These coffees were all excellent but very different. A couple were fruity, one was sweet and full bodied, one reminded me a bit of the local fruit durian, not I hasten to add because of its taste, but because the aroma from the cup was so different from the flavour of the drink. It was a great privilege to be able to try these different coffees consecutively and to really experience the variety of flavours in coffee. Great care was taken while making the pour over before it was brought over to the table, together with a jug of water, it also seemed to me that the baristas kept a discreet eye on me afterwards to ensure I enjoyed the coffee. 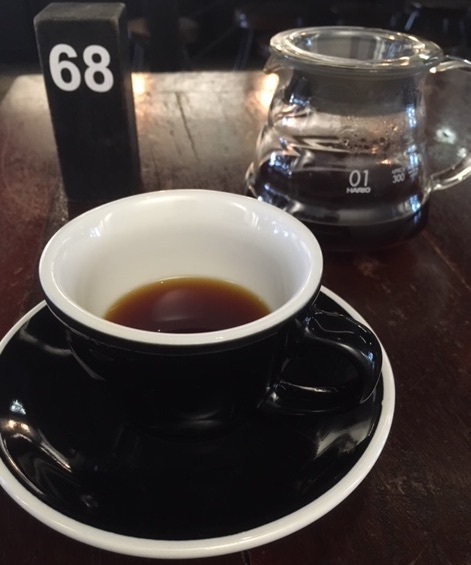 So it was a good experience to have had the opportunity both to enjoy one of those pour overs and to observe the people and the surroundings of VCR when I had to wait for 1 hour for someone with no phone and no book. If you get the opportunity to do this I would very much recommend it. Find a comfortable café, order a coffee and then sit, without distractions, and watch what your mind notices and where it wanders for an hour. An obvious place for a mind to wander would be to the mechanism of tape recording (and why mini-disks are the superior recording medium for the elegance of the physics involved). However, in an hour a mind wanders far further than the name. Supporting the cakes (and a display case for the 2nd place award of the brewers cup), was a table with a concertina type decoration around its edge. Was this a nod to the Kalita Wave brewing device? 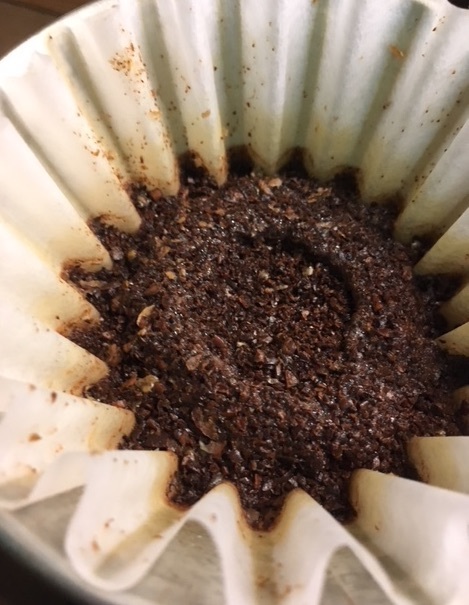 This is a significant difference between the V60 and the Kalita Wave: the ridges (or wave pattern) on the filter of the latter. How does coffee flow past these ridges? Does this difference in flow dynamics make a difference to the taste of the coffee? 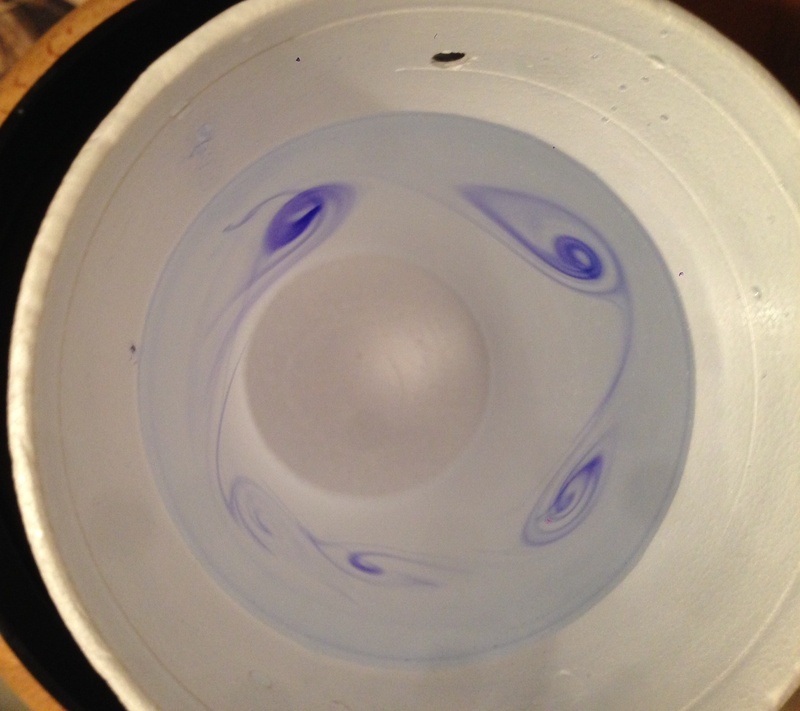 It seems that there would be a lot of physics to observe in the fluid flow in a Kalita Wave filter. A few weeks previously a friend had made a (lovely) coffee with her Kalita Wave. It was interesting to note the different dose of coffee she used and the way the grinds built up in the ridges (compared with my ‘normal’ V60). Why do the grinds end up in the ridges? Why is there a layer of dust on the blades of a fan? Why do some corners of a building collect more dust or leaves than others? Are these questions related and does it change the flavour of the coffee in the Kalita? In fact, there are many subtleties in understanding how fluids move around solid objects. One of these is that at the interface of the fluid with the solid, the fluid does not flow at all, there is a stationary layer. Known as a boundary layer or Prandtl boundary layer (after the person who first suggested their existence, Ludwig Prandtl), realising these layers existed revolutionised the field of aerodynamics. The problem had been how to model the drag experienced by a solid object in a fluid flow. Although perhaps only of academic interest in terms of the flow of coffee around a Kalita filter or a spoon, by the end of the nineteenth century and particularly, with the invention of airplanes, how to calculate fluid (i.e air) flow around a solid (i.e. wing) object became very important for practical reasons. Vortices created at the walls of a mug when the whole cup of coffee is placed on a rotating object (such as a record player). Prandtl introduced the concept of a boundary layer in 1904. The idea allowed physicists to treat the main body of the moving fluid separately to the layer, very close to the solid, that was dominated by friction with the solid. This meant that the Navier-Stokes equations (that are used to describe fluid flow and ordinarily do not have an analytical solution) are simplified for this boundary layer and can be quantitatively solved. Although simple, by the 1920s Prandtl’s layer (and consequently the solvable equations) were being used to quantitatively predict the skin friction drag produced by airplanes and airships. The boundary layer allows us to understand how vortices form behind cylinders or around the corners of buildings. I suspect a mix of the boundary layer, turbulence caused by the coffee going over many of the ridges and the brick like stacking/jamming of the coffee grains would combine to explain the difference in the grind shape around the Kalita Wave and the V60 filters. What this does to the flavour of the coffee and whether better brewing would involve more agitation, I will leave to Kalita Wave coffee lovers to investigate. And when you do, I would love to hear of your results, either here on Facebook or Twitter.